a Mother's Day Brooch swap. and present it in a fun way. before, and she's a fun partner! I was thrilled when my beautiful brooch arrived! and I am in love, LOVE! I actually have a small collection of these brooches. tied around a bundle of beautiful ephemera. Look at that sweet little baby! eeek! to once again swap with you! Thank you so much for my beautiful gifts! because I think she is such an amazing lady. and opens up to a full heart. a son and a daughter. I chose as her gift brooch. Thank you Linda for hosting another beautiful swap! You can visit Linda's blog to see more beautiful brooches. surrounded by those you love! Debi- That brooch she sent you is marvelous- I have never seen one quie like it..and you have a collection of them? Wow- love that! Wishing you a Happy Mother's Day! Your post takes my breath away! The brooch that you received is do die for! Not to mention all that beautiful ephemera! Then I went on to see what you sent and I was equally blown away! The presentation is gorgeous and the American Flag in honor of her son is so dear. What a great job the two of you did! Very nice brooches, given and rec'd. That was extra special to make her the darling folding heart. Both brooches are beautiful and you both did a great job on the presentation. The heart is lovely and so unique. Your post is wonderful. Wow, your partner is so creative...blows me away! The brooch she sent is so detailed and I really like the one you chose for her too. Wouldn't it be a hoot if all of us ladies could meet in person 'today' wearing our Mother's day Vintage brooches? I agree Linda plans the most amazingly fun swaps. Debi, Thank you for your sweet comment on my blog. What a sweet swap! 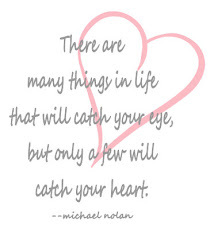 The heart you made for your partner was very special...so obvious you put a lot of thought and love into it. I can't imagine what it must be like to have a child stationed over in Iraq. Oh my gosh! You are both very lucky indeed!! How fun. Hi Debi, sorry I have been missing in blogland for so long, and thank you for visiting me at my new blog. 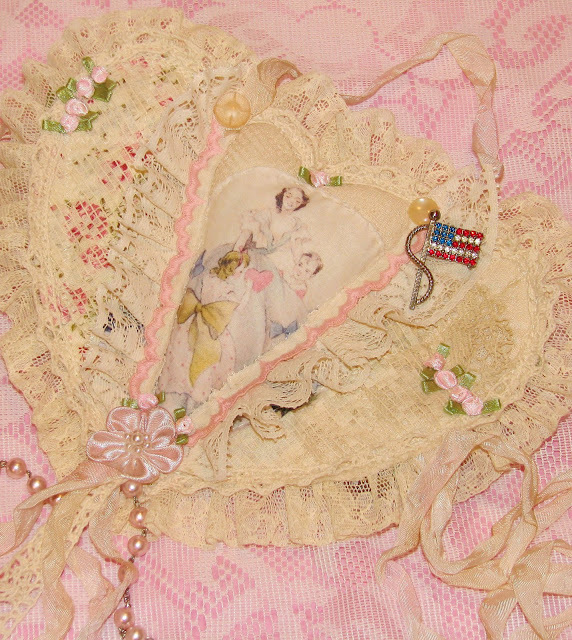 I absolutely love this heart you created, it is so unique, love the soft cream lace and that image is perfect. 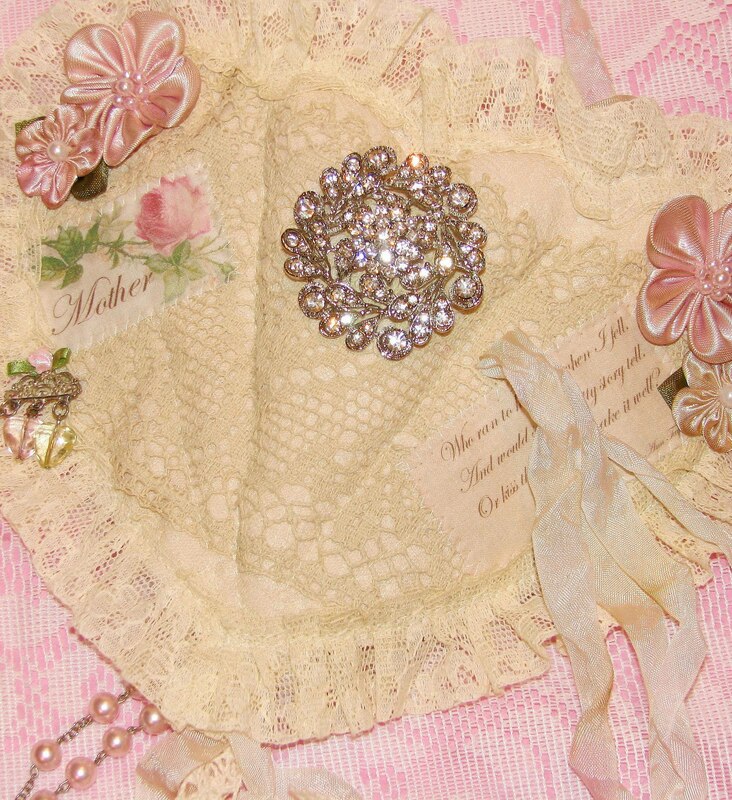 Your brooch is gorgeous too, I have one very similar given to me by my special aunt/friend. I hopped to your blog and saw this gorgeous fabric bundle you made for the brooch swap. It has been in my head for a couple days now. So beautiful. It inspires me to try to make something like it...which will be a first as I don't do much with fabric. Thank you for sharing it. both vintage brooches are very beautiful and pretty.